The role of the patient as an active partner in health care, and not just a passive object of diagnostic testing and medical treatment, is widely accepted. Providing information to patients is considered a crucial issue and the central focus in patient educational activities. It is necessary to educate patients on the nature of the outcomes and the benefits and risks of the procedures to involve them in the decision-making process and enable them to achieve fully informed consent. Information materials must contain scientifically reliable information and be presented in a form that is acceptable and useful to patients. Given the mismatch between public beliefs and current evidence, strategies for changing the public perceptions are required. Traditional patient education programmes have to face the potential barriers of storage, access problems and the need to keep content materials up to date. A computer-based resource provides many advantages, including “just-in-time” availability and a private learning environment. The use of the Internet for patient information needs will continue to expand as Internet access becomes readily available. However, the problem is no longer in finding information, but in assessing the credibility and validity of it. Health Web sites should provide health information that is secure and trustworthy. The large majority of the Web sites providing information related to spinal disorders are of limited and poor quality. Patient Line (PL), a patient information section in the Web site of Eurospine, was born in 2005 to offer patients and the general population the accumulated expertise represented by the members of the society and provide up-to-date information related to spinal disorders. In areas where evidence is scarce, Patient Line provides a real-time opinion of the EuroSpine membership. 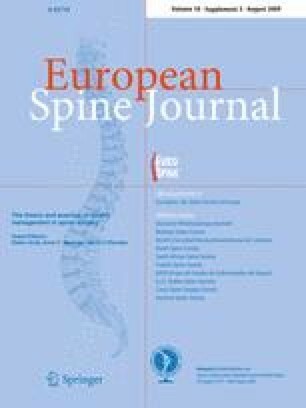 The published data reflect the pragmatic and the common sense range of treatments offered by the Eurospine membership. The first chapters have been dedicated to sciatica, scoliosis, cervical pain syndromes, low back pain and motion preservation surgery. Since 2008, the information has been available in English, German, French and Spanish. The goal is for Patient Line to become THE European patient information Web site on spinal disorders, providing reliable and updated best practice and evidence-based information where the evidence exists.